The increase appeared to occur almost entirely among adults. Among adolescents aged 12 to 17, past-month marijuana use went from 10.5 percent to 11.2 percent in Colorado and 9.5 percent to 9.8 percent in Washington state — neither of which are statistically significant increases. But among adults 18 and older, use increased from 10.4 percent to 12.9 percent in Colorado and 10.3 percent to 12.5 percent in Washington state — both statistically significant. 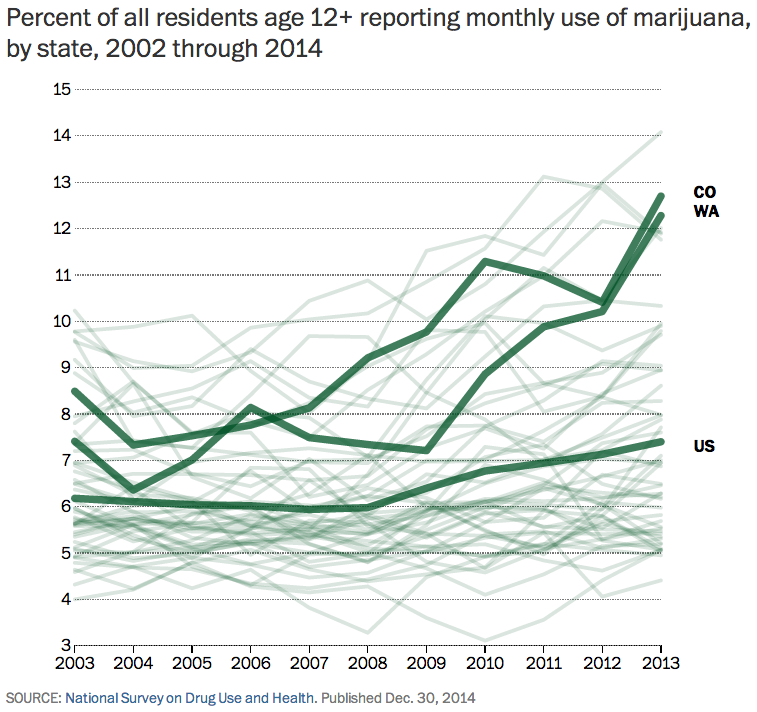 Overall, I’d expect to see a continued rise in adult use in states that legalize weed. A big part of this will probably be the novelty factor: people who were previously discouraged from using marijuana due to its legal status may be tempted to give it a whirl when they can simply walk down the street and buy some at the store. But weed isn’t for everyone (see: Dowd, Maureen). It’s reasonable to expect that many, if not most, new users may simply try it once or twice and decide it’s not their thing. This seems to be what happened in Portugal, which decriminalized all drugs in 2000: use rates rose in the year or two after decriminalization, but have fallen since then. Marijuana legalization experiments in the U.S. may very well yield similar results. By itself, rising cannabis consumption should count as a benefit of legalization, since it indicates an increase in consumer satisfaction. There may be costs as well, but at this point their nature and magnitude are not clear. The impact of legalization on car accidents, for instance, will require years to assess. Since alcohol has a more dramatic effect on driving ability than marijuana does, legalization could reduce traffic fatalities if more pot smoking is accompanied by less drinking. So far that sort of substitution has not happened in Colorado, where past-month alcohol consumption rose slightly between 2011-12 and 2012-13, although the change was not statistically significant. Washington, by contrast, saw a statistically significant drop in past-month alcohol use. Previous Previous post: Did North Koreans Even Hack Sony In The First Place?